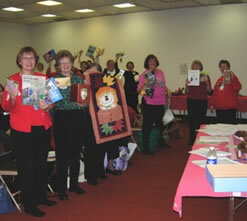 The local chapter is a community of people who are excited about sewing. All kinds of people! Some members have advanced or professional sewing skills and others are at the beginner level. Our members enjoy all types of sewing – garment, décor, craft and quilting. We share our skills, and it’s definitely nice to share our successes and challenges with friends. Our Chapter meets monthly (excluding August and November). On the Events Page you can see upcoming meeting dates and programs scheduled for that month; as well as upcoming Special Events. Our meetings normally consist of a program, general business and of course Drag and Brag (bring an item you have sewn to share). Some members use Drag and Brag to solicit advice with a troublesome sewing project. ASG is a national organization which provides the structure for the local chapters and arranges for many of benefits to be available nationwide. Guild members receive the ASG national publication, Notions, filled with an inspiring variety of projects and tips, the latest sewing industry news, new products, introductions to sewing experts and Guild news. In addition to the national publication, the Northern Nevada Chapter publishes a newsletter 4 times a year that communicates local Chapter events and activities and features special interest articles. We also send e-blast reminders with meeting dates, and upcoming activities. In addition, almost half of the advertisers in Notions, the national ASG quarterly publication, also regularly offer discounts on their sewing products, publications and events, free shipping, and lots more. Those Special Offers are listed and updated every quarter on the password-protected Members Only section of this Web site. Join now (see the Join Now tab on the Home page) to receive your password, and take advantage of the great benefits of membership in the ASG! Whether you’re new to sewing, returning to sewing, looking to advance your sewing skills or just want to participate in virtual group meetings, you will find ASG’s free online sewing classes and programs a major benefit of membership. Check out ASG.org for the class offerings. ASG members pay a special member’s price for conference registration where attendees participate in workshops and seminars taught by nationally recognized professionals. Members may also shop the Exhibit Hall, enjoy special events and attend optional workshops and tours. Visit the Conference page at ASG.org for more information.